A light and silky skincare system containing an advanced clinically proven serum, a renewing day cream and an intensively nourishing night cream. 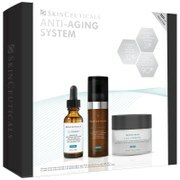 This daily skincare regime helps prevent and reduce the first signs of premature aging. Use as part of your daily skincare routine. Smooth No7 Protect & Perfect Advanced Serum onto a clean face and neck with your finger tips. In the morning follow with No7 Protect & Perfect Day Cream. At night, follow your serum application with No7 Protect & Perfect Night Cream to help skin recover from the day and smooth the appearance of fine lines while you sleep. Day Cream: Aqua (Water), Glycerin, C12-15 Alkyl Benzoate, Octocrylene, Butyl Methoxydibenzoylmethane, Dimethicone, Cetearyl Glucoside, Aluminum Starch Octenylsuccinate, Ethylhexyl Salicylate, C18-36 Acid Glycol Ester, Ammonium Acryloyldimethyltaurate/VP Copolymer, Phenoxyethanol, Alcohol Denat., Bis-Ethylhexyloxyphenol Methoxyphenyl Triazine, Cetearyl Alcohol, Potassium Cetyl Phosphate, Dimethiconol, Butylene Glycol, Methylparaben, Parfum (Fragrance), Xanthan Gum, Diethylhexyl Butamido Triazone, Ethylparaben, Dipropylene Glycol, Retinyl Palmitate, Ascorbyl Glucoside, Tetrasodium EDTA, T-Butyl Alcohol, Lupinus Albus Seed Extract, Carbomer, Phyllanthus Emblica Fruit Extract, Dimethylmethoxy Chromanol, Polysorbate 20, Potassium Hydroxide, Ginkgo Biloba Leaf Extract, Simethicone, Ethylhexylglycerin, Tocopherol, Palmitoyl Oligopeptide, Palmitoyl Tetrapeptide-7. Night Cream: Aqua (Water, Eau), Glycerin, PPG-15 Stearyl Ether, Sorbitan Stearate, Demethicone, Butrospermum Parkii (Shea Butter, Beurre De Karite), Ethylhexyl Stearate, Cetyl Alcohol, Polyacrylamide, C13-14 Acid Glycol Ester, Dimethiconol, Butylene Glycol, Parfum (Fragrance), Sucrose Cocoate, Methlparaben, Carbomer, Laureth-7, Ethylparaben, Dipropylene Glycol, Retinyl Palmitate, Xantham Gum, Ascorbyl Gluoside, Tetrasodium EDTA, Potassium Hydroxide, Lupinus Albus Seed Extract, Dimethylmethoxy Chromanol, Phyllanthus Emblica Fruit Extract, Polysorbate 20, Gingko Biloba Leaf Extratc, BHT, Tocopherol, Butylparaben, Palmitoyl Oligopeptide, Silica, Propylparaben, Palmitoyl Tetrapeptide-7. Advanced Serum: Dimethicone, Aqua (Water), Dimethicone crosspolymer, Butylene glycol, Glycerin, Alcohol denat., Sodium ascorbyl phosphate, PEG/PPG-18/18 Dimethicone, Magnesium sulfate, Phenoxyethanol, Cetyl PEG/PPG-10/1 dimethicone, Polyglyceryl-4 isostearate, Hexyl laurate, Retinyl palmitate, Hydrolyzed rice protein, Propylene glycol, Tocopheryl acetate, Sorbitan laurate, Salicylic acid, Methylparaben, Ethylparaben, Carbomer, Medicago sativa (Alfalfa) extract, Polysorbate 20, Hydroxyethylcellulose, Panax ginseng root extract, Morus alba leaf extract, Sodium benzoate, Acetyl dipeptide-1 cetyl ester, Tocopherol, Ethylhexylglycerin, Palmitoyl oligopeptide, Palmitoyl tetrapeptide-7. My wife is very impressed with this system. I'm 63 and have worked outside all my life and I'm using some of the night cream on my face. I also like it. Will get more when we need it. Great product and fast service after ordering. i started using boots No. 7 Products for 4 months now, & I absolutely Love Love the Products & I highly recommend these Products. I have noticed a great difference in my skin. I have gotten compliments from strangers regarding how fresh , radiant and nice my skin looks! I look forward every morning and nights to use my skin care products. they feel so Silky and Smooth. I absolutely Love how it feels on my skin! I give these products a 10+!!! try them...You will never use another product after using Boots No.7!!! trust me!